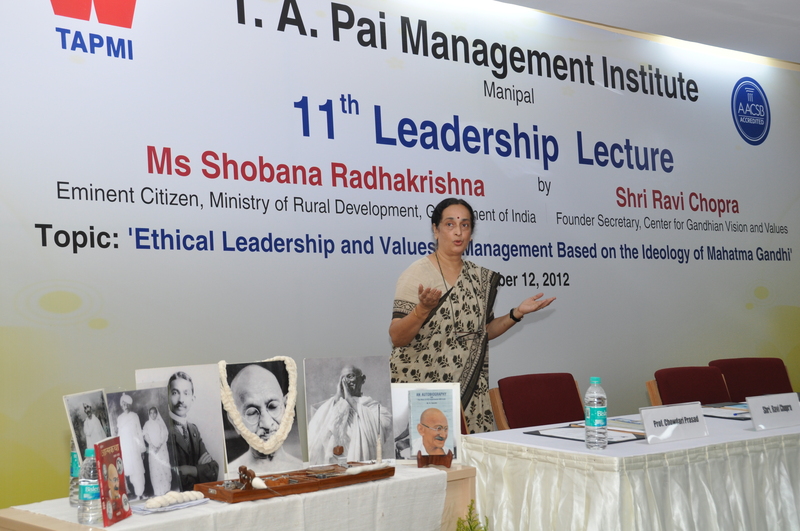 Ms Shobana Radhakrishna, Eminent Citizen, Ministry of Rural Development, Government of India and Shri Ravi Chopra, Founder Secretary, Centre for Gandhian Vision and Values, delivered an inspiring leadership lecture on ‘Ethical Leadership and Values in Management Based on the Ideology of Mahatma Gandhi’ to the students of T.A. Pai Management Institute (TAPMI), Manipal. This lecture, organized by TAPMI, is the eleventh in its unique Leadership Lecture Series which is an initiative to nurture future leaders by providing a platform to the young business minds to interact with the great leaders of today. Dr. Shantaram (Trustee and Member of TAPMI’s Governing Council) and Professor Chowdari Prasad (Dean of Planning and Development) were also on the dais. The audience consisted of post graduate management students and faculty of TAPMI besides invitees and press personnel. The event started with the traditional lighting of the lamp, followed by a warm welcome of the dignitaries and an introductory speech by Professor Chowdari Prasad. Dr. Shantaram, delivering his presidential remarks, spoke on the importance of the ideology of Mahatma Gandhi, in this era. He spoke of the significance of the word ‘Mahatma’ and the reasons why we should remember him every day and not just on one day in a year – the 2nd October. Ms Shobana Radhakrishna opined that Gandhiji’s life was an epic of faith and endeavour. In his quest of truth, he came across two aspects: truth is God and everyone has an element of goodness within themselves. She spoke of the wretched incident – assassination of Mahatma Gandhi, that occurred 65 years ago; yet, it is now, in this era that the ‘Gandhian era’ will, and, has to start. She showed the audience a few disturbing pictures of violence all over followed by and contrasting with some inspirational and heart touching pictures of kindness. She spoke about the life of Gandhiji; how he started and ended his day with prayers - that were conducted in the open sky and paid respects to all religions. She believed Gandhiji considered time as more valuable than money, and she thanked the audience for giving her time to deliver this inspiring speech today. The audience was privileged to have a brief glance of the simple life led by Gandhiji as narrated by the eminent citizen Ms Shobana Radhakrishna. Gandhiji’s quest was the quest for truth. His truth was not clouded by the fear of society. “It is wrong to think that business is incompatible with ethics. I know that it is perfectly possible to carry on one’s business profitably, and yet honestly and truthfully” – said Mohandas Karamchand Gandhi, the Father of our Nation. She said that the faith in the people in India is what sustained him. She also threw light on Gandhiji’s HindSwaraj and about how he used to be positive even under difficult circumstances and never lost hope; rising above personal sorrows and happiness and sharing happiness and sorrows of others – about how he looked at life holistically and worked with utmost concentration. She went on to explain how his efficiency, sincerity, avoidance of negligence, delegation of task to the right person, attention to the minute details, concentration, and honesty with positive confidence brought about positive strength in him. He was a great listener and had the ability to see a human being as a human being without any titles. He had an ever growing and progressive personality. This, Ms. Radhakrishna says, is what integrates and correlates in today’s corporate management world as well. Mr. Ravi Chopra, who followed the speech gave a brief introduction on Gandhiji. He spoke as to how great leaders like Martin Luther King Jr., Nelson Mandela, Pope John Paul II, the 14th Dalai Lama, Albert Einstein, Barack Obama, Dr. A.P.J. Abdul Kalam, and the like, were influenced by Gandhiji and his teachings. He also showed clippings depicting how Gandhi has influenced anyone and everyone including several Nobel Laureates, be it famous personalities or people in prison. The leadership lecture concluded with a prayer followed by an interactive question answer session. Prof. Vinod Madhavan, TAPMI, delivered the vote of thanks.